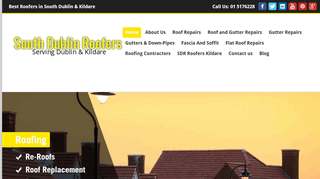 South Dublin Roofing provide a full roofing contractor service in Dublin and South Dublin. These services include: roof repair, flat roof repairs, chimney repairs, loose tiles, gutters and fascia board repairs and installs. Call us for a quote today. Roof repairs Dublin, Roofers Dublin, roof quote and free estimates, roof specialist reports and evaluations in Dublin South, North, West & City Centre.